Sister, Molly McGuire, GNSH died on January 27, 2016. Following is the Remembrance of her which was given by Sister Diane Bardol at Molly’s funeral liturgy. May she rest in peace in the arms of her compassionate God! Sister Molly made it known that she wanted her eulogy to focus on Resurrection not on her life, but because I didn’t know this until after the eulogy was written and because I wouldn’t know how to carry out her request, I ask you to put it in the context of Resurrection as you listen to how Sister Molly went about her daily life. Sister Molly McGuire, GNSH, 98, formerly Sister Mary Angela, died January 27, 2017(feast of St. Angela Merici) at St. Joseph’s Manor, Meadowbrook, PA in the 84th year of her religious life. Born February 3, 1918 in Mahanoy City, PA, to Michael F. and Rebecca Love McGuire, and baptized Margaret Jane, Molly attended St. Canicus School from the third to the tenth grade. She entered the Grey Nuns of the Sacred Heart in 1933 and completed her high school studies at Melrose Academy and received her BS in Education from D’Youville College in Buffalo, NY. Her elementary school apostolate took her to New York, Massachusetts and Pennsylvania, including 2 years at her home parish of St. Canicus. Sister taught for 27 years in Queens, NY where she served at Blessed Sacrament, St. Joan of Arc, Our Lady of Fatima, St. Leo’s and Msgr. McClancy High School at various times from the 1940’s through the early 1980’s. Sister Molly moved to the Motherhouse in 1984 and became involved in a variety of duties until her retirement in 1992. Molly enjoyed going to Grey Nun Academy to teach the children about St. Marguerite d’Youville. In doing that, she would bring the children to the Motherhouse and show them the shrine in the narthex of the chapel and show them all the other related items. Often she brought the children to Sister Marlene’s office where they would see the statue of Our lady of Providence and learn that story. In 2010 she moved to D’Youville Manor and eventually to St. Joseph’s Manor where she lived until the time of her death. Molly’s parents and her seven brothers, James, John, Stephen, Robert, Francis, Cornelius and Thomas preceded her in death. She is survived by her religious community as well as cousins and many friends. Much of what you just heard can be found in her obituary published in various newspapers. But being survived by her religious community, there is much more that can be shared about Sister Molly’s life that will warm your heart and bring you joy. Molly could easily be awarded the title “Queen of the Clean.” When Molly came to live in the Motherhouse she always took a shower before going to bed, not unusual, but when she rose at 4 the next morning she took another shower. Her clothes were not allowed to get soiled. They were washed every day, much to others’ consternation when getting the washing machine became a daily challenge. Even the statues on the Motherhouse property came under her cleanliness standards! She gave her saved money to have them washed. Maureen Goodall, Community Life Assistant, said that it was Sister Molly who unknowingly taught her what a clean laundry looked like simply by coming in after it was cleaned and putting the finishing touches on it. Molly knew everyone and everything that was happening at the Motherhouse and D’Youville Manor. She took it on very naturally as part of her new ministry. Being such an early riser, Molly was the “unofficial” Official Greeter to all the staff who came on duty at 6 a.m. She checked on their personal well-being and that of their family. She got to know each of them personally. Would her clothes be washed to her specifications? As a teacher she is remembered for her infectious laughter, as looking like a little doll dressed in the Grey Nun habit, for her pride in being an American first and Irish second and instilling that in her students; American first, your cultural heritage second. That being said, she loved the Fighting Irish of Notre Dame and taught her fourth graders their song! No doubt that was because she belonged to the fighting Irish of Mahanoy City. When Molly read an article about hydraulic fracturing or fracking being praised as the modern equivalent of coal mining that would bring jobs and abundant fuel to the U.S. that was more than her fighting Irish temperament could take. To Molly, who called herself a coal cracker, there was nothing of coal mining that should be perpetuated. It was the one thing that motivated her fighting Irish spirit to write to her congress man opposing fracking! On the day Molly died she told the aid she did not feel well and she would die this day. Later, that staff member commented that Molly was a woman of her word. I would like to acknowledge that the content of this eulogy has been made possible through the generous contributions of many Grey Nuns of the Sacred Heart, former Grey Nuns of the Sacred Heart and co- workers. Sister Molly McGuire, Woman of her Word, Social Queen and Queen of the Clean! It is fitting that we conclude with Molly’s own words taken from the obituary that she wrote on September 23, 1985. “May Molly’s soul, through the intercession of the Mother of God, share in the promises of Christ.” We answer AMEN. 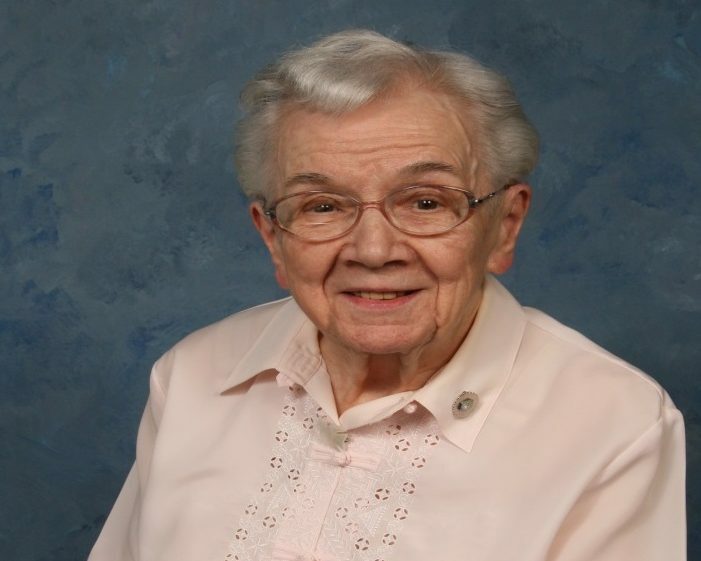 Sister Molly McGuire, GNSH, 98, formerly Sister Mary Angela, died January 27, 2017 at St. Joseph’s Manor, Meadowbrook, PA in the 84th year of her religious life. Born February 3, 1918 in Mahanoy City, PA, to Michael F. and Rebecca Love McGuire, Margaret Jane attended St. Canicus School from the third to the tenth grade. She entered the Grey Nuns of the Sacred Heart in 1933 and completed her high school studies at Melrose Academy; receiving her BS in Education from D’Youville College in Buffalo, NY. Her elementary school apostolate took her to New York, Massachusetts and Pennsylvania, including 2 years at St. Canicus. Sister taught for 27 years in Queens, NY. She served at Blessed Sacrament, St. Joan of Arc, Our Lady of Fatima, St. Leo’s and Msgr. McClancy High School at various times from the 1940’s through the early 1980’s. Sister Molly moved to the Motherhouse in 1984 where she performed a variety of duties until her retirement in 1992. In retirement, she particularly enjoyed visiting the primary grades at Grey Nun Academy where she taught the eager children about St. Marguerite d’Youville. Requiring additional care, in 2010 she moved to D’Youville Manor and then St. Joseph’s Manor where she lived until the time of her death. Predeceased by her parents and brothers, James, John, Stephen, Robert, Francis, Cornelius and Thomas, she is survived by her religious community as well as cousins and many friends. Visitation will be Saturday, February 4, 2017 at 9 a.m., followed by Mass at 10 a.m., in the Holy Redeemer Sisters Chapel, 521 Moredon Road, Huntingdon Valley, PA 19006. Interment will be at Resurrection Cemetery (5201 Hulmeville Rd, Bensalem, PA 19020) immediately following the Mass of Christian Burial. In lieu of flowers, memorial donations in Sister’s memory may be made online to the Grey Nuns of the Sacred Heart, or by mail at the following address:14500 Bustleton Avenue, Philadelphia, PA 19116. I was the grey nuns chef for close to 15years. Every morning Sr. Molly would greet me in the kitchen of the Motherhouse and ask how i am doing and if I had my coffee yet.if i had donuts ( one of her guilty pleasures) we would sit down and and split one over a coffee and her hot tea. As we discuss current events or just life in general. She was like a 2nd mom to me and a grandmom to my 2 children, taking them to the chapel and giving them a tour and history lesson. She was always available for a quick chat, a smile, and she sure new how to keep me on my toes. Sister was my second mother and I miss her terribly. sister was my 4th grade teacher in 1947 at St. Leo’s school in Corona. I just returned from her viewing and funeral mass here in PA. RIP. Loved Molly! Dear friend and school mate of my father, visited with us on Long Island NY many times. My parents took me to visit her in Jackson Heights Queens when I was a toddler. We have home movies of Sister Mary Angelis…Sister Molly McGuire! I remember her as Sr Mary Angela in St. Jon of Arc school back in 1949. I remember her as being friendly, kind, pretty and very sweet. When I think of my childhood, I will think of you and say a prayer. Rest in peace. May she Rest In Peace. She is heaven with God, her family and friends. With our sincerest sympathy and prayer for all those who have been sadden by her death and will miss her. May Mollie rest in peace. Mollie was an inspiration to all who encountered her. I lived with Mollie in different places. She helped me survive my first year in Mahanoy City; also in Corona. Laughter got us through many times. She will be remembered in my prayers. I.m glad to see our students also remember. My first introduction to D’youville Manor and the Grey Nuns, where I volunteered for many years, was through Sister Molly. She was a joyful and delightful person. The residents of D’Youville Manor were so pleased when she visited every day. My acquaintance with Sister Molly and many Gray Nuns enhanced my life. She will bring joy to heaven. Rest in Peace Sister. Sister taught at St. Leo’s when I was there and I remember her as being very sweet and kind. She served the Grey Nuns well and may she now rest in peace. In addition, I see that Frances Beltram also mentioned Sister in her post. I went to school with her brother Ronald Beltram in St. Leo’s and I have a picture of her when she was a postulant in the mother house with Camille Lo Sasso (Sister Stephanie Joseph). She taught me in 4th grade at St. Leo’s in corona queens. When I entered the Grey Nuns , I lived with her at Holy Angels in buffalo. She was such an inspiration to all who knew her. Her laughter was contagious. She had such a love for Notre Dame ans as youn fourth graders she taught us their fighting song. Rest in peace dear sister and pray for us . May Sister Rest Peacefully, she certainly served the Lord and his followers for many years. God bless her beautiful soul.